Urban Health Wheatgrass Powder is organically grown without herbicides or pesticides in fertile farmland. Au naturel - just how we like it! They harvest the leaf when it is young and short, which is when it is nutrient and chlorophyll dense. It's quality over quantity! The clever dehydration machine and grinder work at low temperatures, never heating above 24 degrees Celsius, which means their wheatgrass is an undamaged raw whole food. Vitamin C contributes to the reduction of tiredness and fatigue. Every batch is tested in-house AND independently. Finally, the wheatgrass powder is quickly packaged into sachets to limit light and oxidation - keeping it fresh and nutrient rich, right up to the point of drinking. We recommend 1 sachet per day. Mix with water or juice and drink right away. ...and when to take it Mid-morning or mid-afternoon are great times to give your body a green power lift. You&apos;ll find this will give you additional energy and alertness. 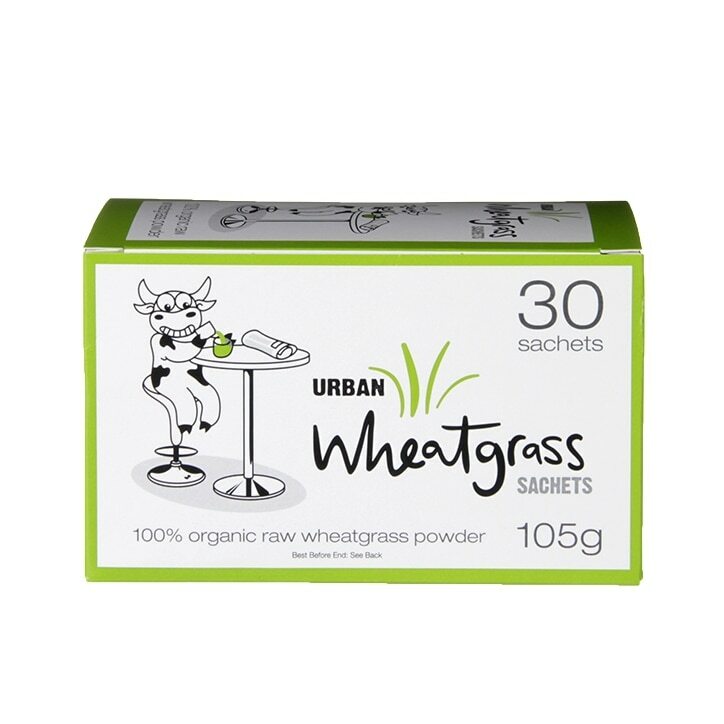 Urban Health Wheatgrass Powder Sachets is rated 4.8 out of 5 by 13. Rated 5 out of 5 by Sophie86 from Great flavor and tasty! I bought this wheatgrass powder two weeks ago. The tasty of it is wonderful and it feels very healthy! Rated 5 out of 5 by J Lo from Amazing energy I bought this after reading it was beneficial for those on chemo and thought I would give it a try. My first tasting was a bit of a shock as it doesn't mix very well and did taste like grass. However I have been mixing it in a glass of apple juice and stirring in between downing it so I am now used to it. I believe it has given me a huge boost and extra energy whilst providing me with beneficial nutrients and plan to continue using it. It wasn't the cheapest but if you consider what you would pay for coffee when out then it is worth it. I used to drink coffee daily for caffeine benefits and no longer need to. Rated 5 out of 5 by New87 from Great Quality The contents in the sachet could be made more small after all it is mixed in juice/water. Rated 5 out of 5 by LisaD1 from Bags of energy. This wheat grass is amazing. I have a glass of wheat grass with water every morning and I am filled with natural energy for the rest of the day. This particular brand is by far my favourite as It taste so good. I wholeheartedly recommend trying it! Rated 5 out of 5 by Maz47 from Been interested in trying wheatgrass for a while, found sachets handy. I have been taking item with pineapple juice & coconut water in a morning, needs a good stir but like the taste. Will carry on taking, think it has been beneficial to me.